My clear signal for the onset of Spring is the blooming of Snowdrops, Galanthus species. The reddening leaves of Dogwoods, Cornus species, tell me that Fall has really begun in my neighborhood of Flatbush, Brooklyn. Soon to come are the yellows of the Locust trees, Gleditsia and Robinia species, and the psychedelic rainbows of White Ash, Fraxinus americana. The big show is put on by the Maples and Oaks. 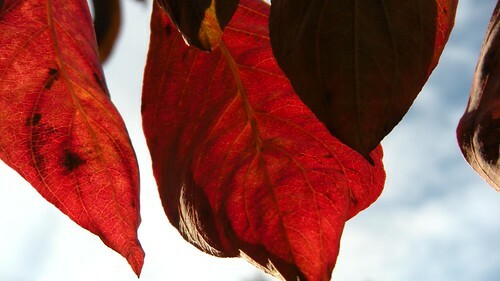 Conditions are ideal for spectacular foliage this year. We've had ample rains over the summer following near-record Spring rains. The NY State Foliage Forecast predicts that peak foliage will reach New York City around the last week of October. This timing couldn't be more perfect. 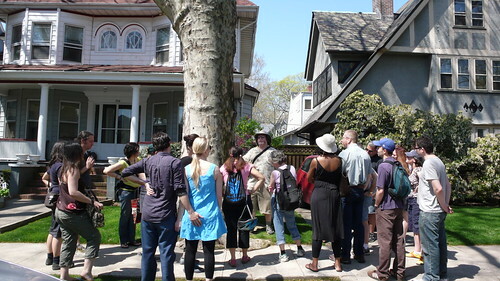 On Saturday, October 24, fellow gardener Tracey Hohman and I will be guiding the first Fall Foliage Street Tree Walking Tour for Sustainable Flatbush. We'll be walking the same route we've visited the past two Springs, so participants can see the same trees this Fall that they've seen in the Spring. 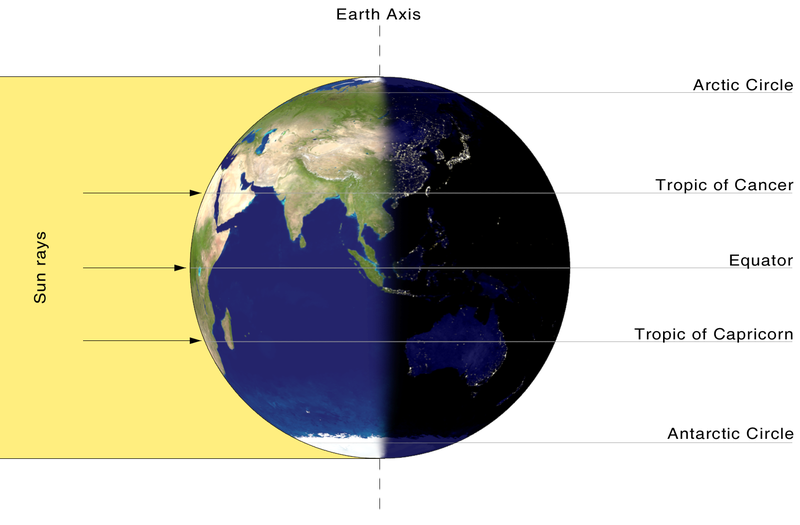 The September equinox (autumnal in the northern hemisphere, vernal in the southern) occurs today, September 22, at 21:18 UTC. Daylight Savings Time puts me at UTC-4, so 17:18, or 5:18pm, local time. 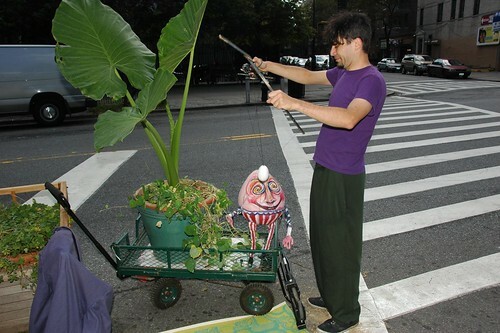 An international event, with 55 sites this year in NYC, Park(ing) Day highlights the public space that is devoted to streets and parking. 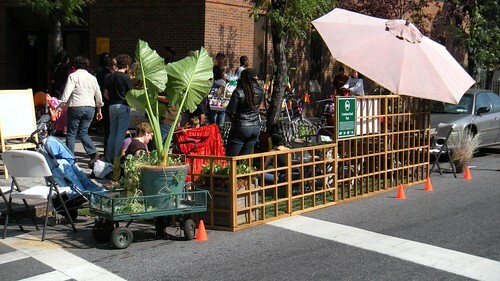 For one day only, groups transform a parking space into a public park. These creative and active sites suggest alternative purposes for such space that can benefit more people in a wider range of uses than storing an empty personal transportation vehicle. 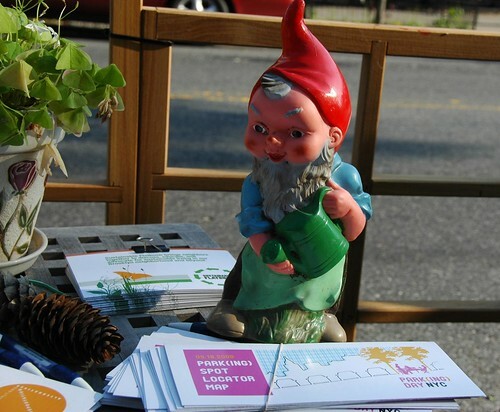 Cortelyou Road Park is a project of the Livable Streets initiative of Sustainable Flatbush. As the Director of the Urban Gardens & Farms initiative of Sustainable Flatbush, I loaned much of my garden furniture and container plants to help transform a parking space on busy Cortelyou Road into a garden room. We're having a great time, and the day is not quite half over as I write this first post of the day. I'll be trying to update during the day. You can also follow me today on Twitter. Over the weekend, 12 newly planted trees were destroyed at Juniper Valley Park in Queens. This incident marks the fourth case of tree damage this year at the park and a $2,500 reward has been offered for information leading to the arrest and conviction of anyone involved in this arborcide. It is believed that the trees were cut with an electric saw, either late Saturday night or early Sunday morning. They were just planted in the park this past spring. Ten were cherry trees and two were oaks. 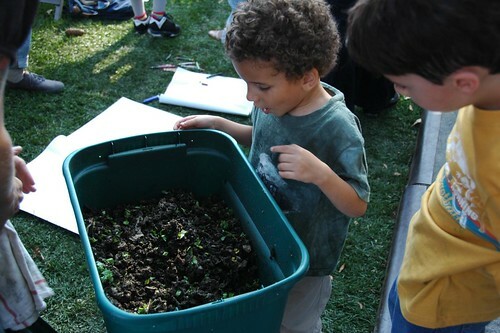 On Friday, September 18th, from 9:00 AM to 6:00 PM, a park will be born: Sustainable Flatbush will transform a single 8’x15’ parking spot into a green space, complete with grass, plants, and seating. 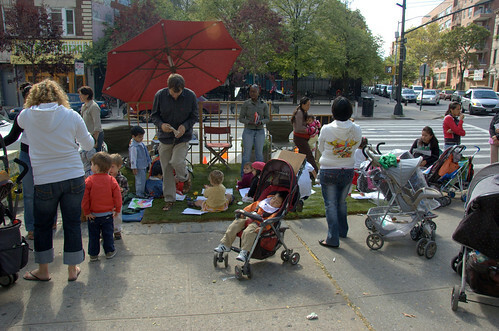 “Cortelyou Road Park,” in front of the Cortelyou Branch of the Brooklyn Public Library, at the corner of Cortelyou and Argyle Roads, in the Flatbush neighborhood of Brooklyn, is one of 50+ sites around New York City participating in Park(ing) Day, an international event. I'm participating again this year. We'll be recreating a garden room in the parking spot, like we did last year, as you can see in the photo above. 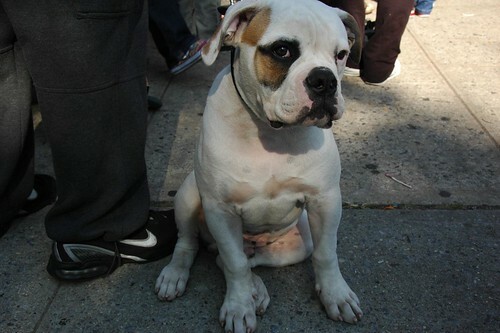 Sunday, I tabled for Sustainable Flatbush at the Flatbush Frolic. 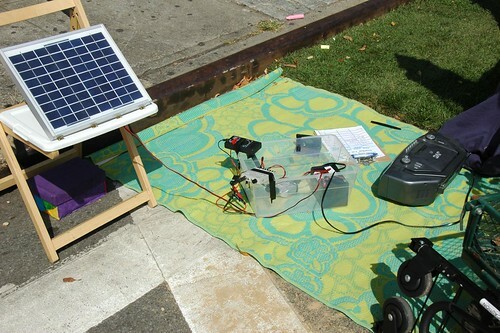 For the second year, Sustainable Flatbush presented an Environmental Fair at the Frolic, partnering with organizations that represent their four main initiatives: Energy Solutions, Livable Streets, Zero Waste, and Urban Gardens & Farms. Now in its 33rd year, the Flatbush Frolic is one of a handful of street fairs that stands out from the hundreds NYC hosts annually. 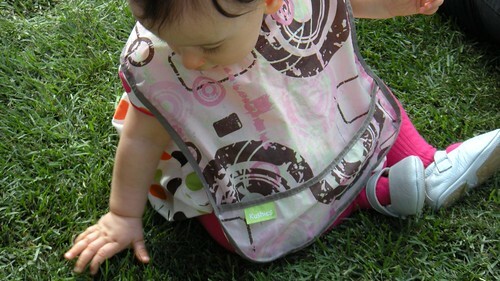 The Frolic is locally organized, and features local businesses and organizations. Because I spent most of the day tabling, I didn't get to see much of the Frolic, but here's some of what I did see.